The 2013 Jordan All-Star Collection is currently making waves in the sneaker market after the first two kicks included in the collection hit the market today. And on Saturday, three more kicks will hit shelves and are expected to make noise like the All-Star editions of the Jordan CP3.VI and Jordan Melo M9. Aside from the Air Jordan 1Mid that we earlier previewed, the Air Jordan 3 Retro All Star will also hit the market on Saturday, February 16. 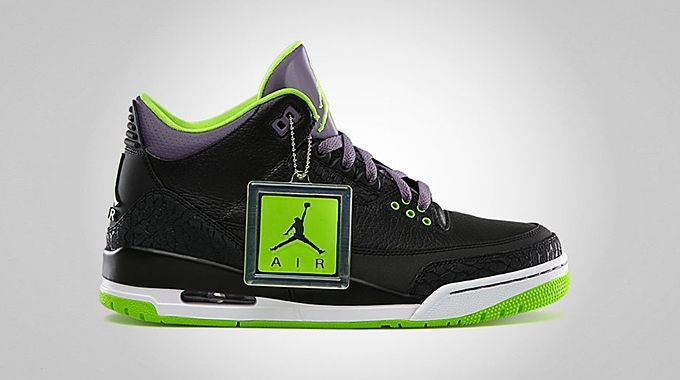 Known as the Black/Electric Green – Canyon Purple – White, this kick could be yours for just $160 per pair.